For those of us in Canada, Thanksgiving is a little over two weeks away and preparations have begun in earnest. 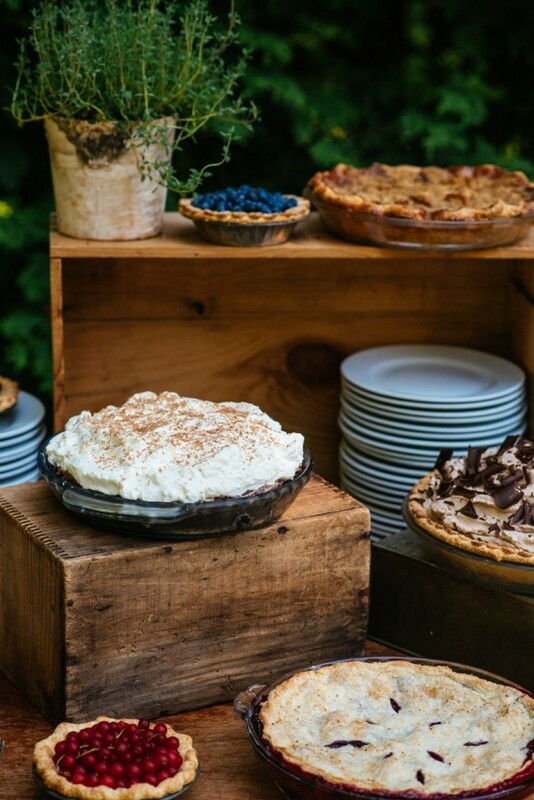 No matter how grand the holiday party plans get, it will be hard to top the pie social we hosted last month as part of a backyard wedding celebration for close family. Since the bride and groom already had a wedding cake out in B.C., it was easy to convince them to go with pie for 80 guests. Pie just makes so much sense for this time of the year. Berries and stone fruits are still holding their spot at the markets; pears and apples as well as pumpkins have arrived. If you’re thinking pie needs to be in your future this fall, read on for recipes, tips and inspiration. Strawberry-Rhubarb. Maple Pecan. Avocado Key Lime. Mocha Cream. 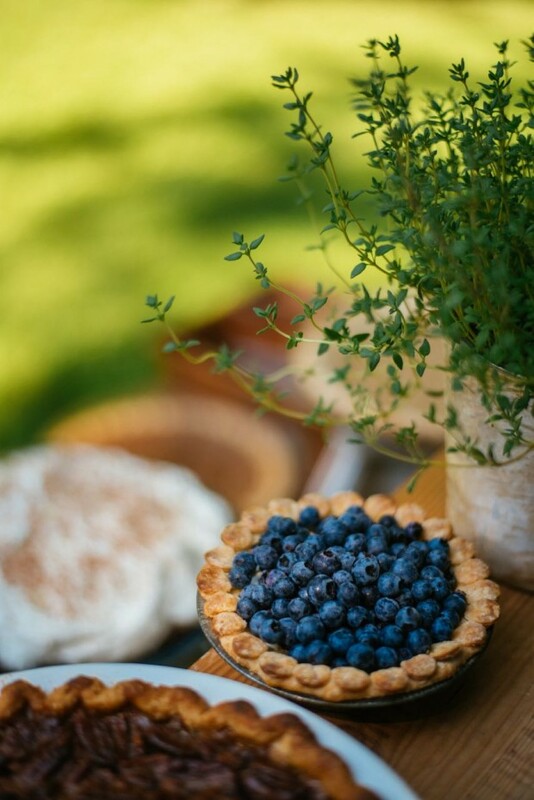 Blueberry Mascarpone. Chocolate Caramel. Lemon Chiffon. Apple Frangipane. 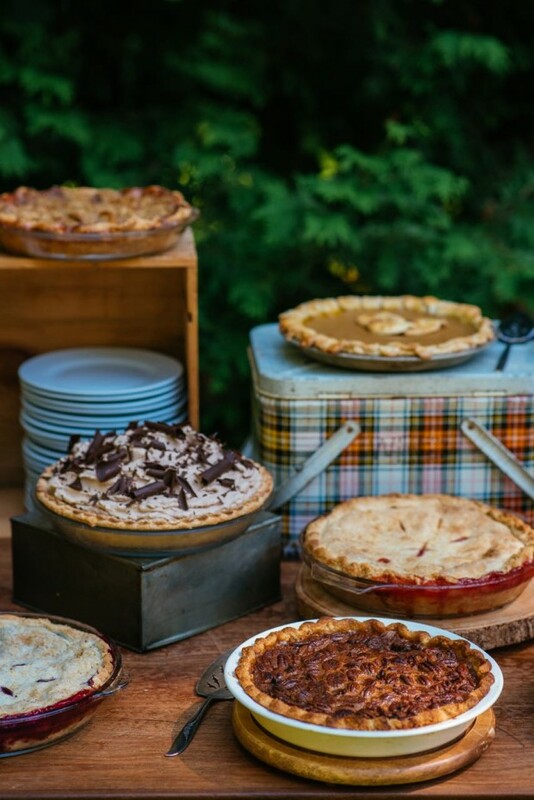 Pumpkin Spice…..just a sampling of the 16 unique pies at our late-summer outdoor pie social. Ohh, la la! One of my longest running strategies for entertaining large groups of people has been to delegate the dessert to guests. 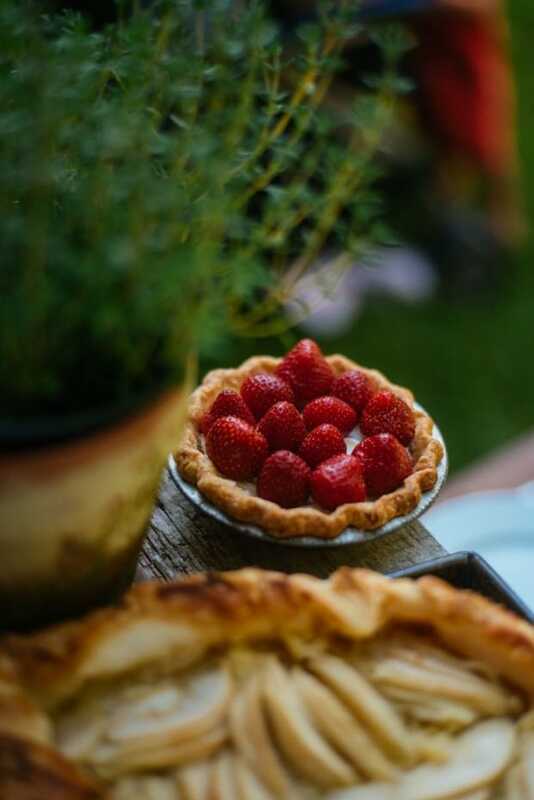 Having bakers bring their homemade pies is what puts the ‘social’ into an event like this one. And as there is no way a host could prepare a spread like this one, sharing is the only way to make it work. When I put out the call for pies for our party, the response rate was 100% – and many people offered to got the extra mile and make two. So perhaps that is my first tip: know who the bakers are among your friends and family and ask them to bake. Now anyone who has made pie from scratch, knows that it is a labor of love. Getting the crust tender and flaky, producing a filling that can stand (not spread) on a plate, and making it as pretty as a picture – there are more than a few ways it can go off the rails. But perhaps the best part of pie is that no matter how it looks, it still tastes wonderful, especially that first forkful. Every single pie that graced my table was fabulous; I couldn’t have been happier! I wasn’t sure what flavours of pie would arrive with my guests, as everyone was free to make anything they liked. That’s another tip, I suppose: don’t assign varieties of pie to your bakers. It’s enough that they are hitting the kitchen for you. Besides, no two pies are ever going to be exactly the same because no bakers are exactly the same. On the flip side, be ready with suggestions and a well-tested recipe if one of your bakers can’t decide on what to make. Here’s a recipe for Maple Pecan Pie, similar to the beauty in the image above. And just below it is my Mocha Pie with Espresso Whipped Cream. Heaven for coffee lovers. Side note: Do you have a favourite pie topping? Is it meringue? Whipped cream? Perhaps streusel (my fave) or simply a classic top crust? 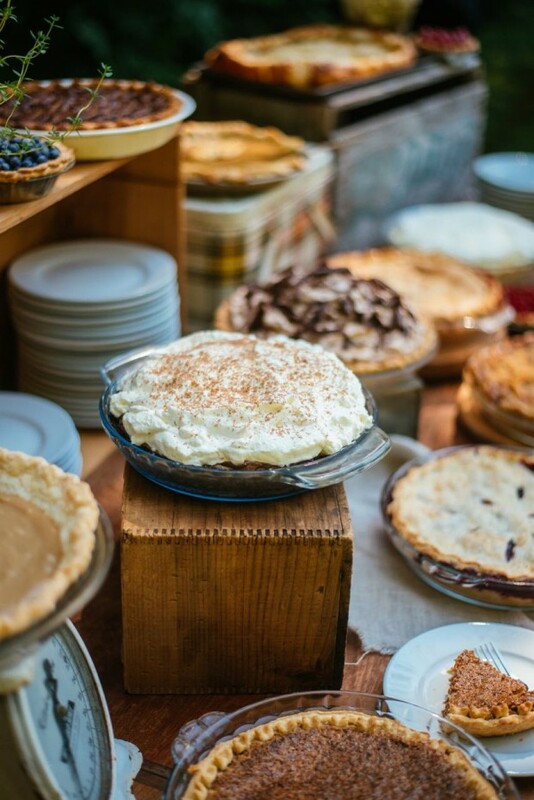 Let’s talk about arranging the table for your pie social for a minute. Here are six different pies at six different heights. Can you see how staggering their heights shows them off better than if they were in a flat row on the table? 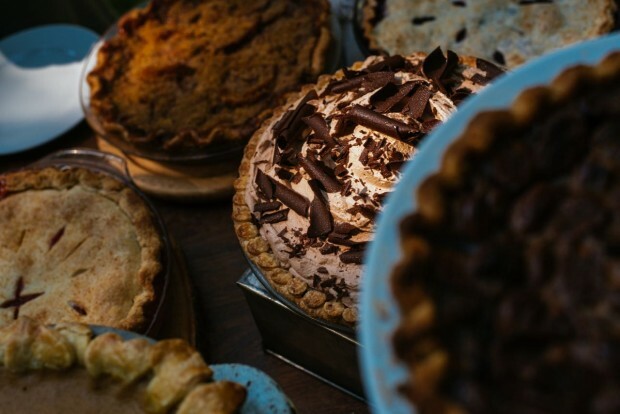 Also, displaying each pie on a pedestal is like giving it its own spotlight. It might be an overturned cake pan, a tin picnic box or a wooden trivet, but a little height adds a great visual appeal to your table arrangement. So it’s later in the afternoon, the sun is slanting, and folks have been scouting out the pie table for some time now. It’s time to cut the pies and you’re going to need at least 6 knives and five friends. This is a lot of pie to cut! These mini berry pies looked so cute tucked in amid the large pies. To make them, I blind baked a half dozen mini pie shells and let them cool. Then I filled them with a mixture of whipped mascarpone, honey and orange zest. Just before serving, I topped them with fresh berries. They would be lovely with fresh figs as well, or really any seasonal fruit that is local to your area. Final tip: make room for the classics, because they really can’t be beat. My mother in law made the flawless strawberry-rhubarb pie (above image, lower right) and it was the first pie to be gobbled up. I mean, that combination is just killer. Here’s a great version I love as well: Strawberry Rhubarb Pie with a Whole Wheat Crust. Even if they have been done over and over for decades, classic pies still deserve a spot at the pie social. The chocolate cream pie (above) that our Aunt Barbara made was hugely popular with the younger crowd. I hope that pie, with its mound of whipped cream and cool chocolate custard, is one of the memories they keep from this gathering. 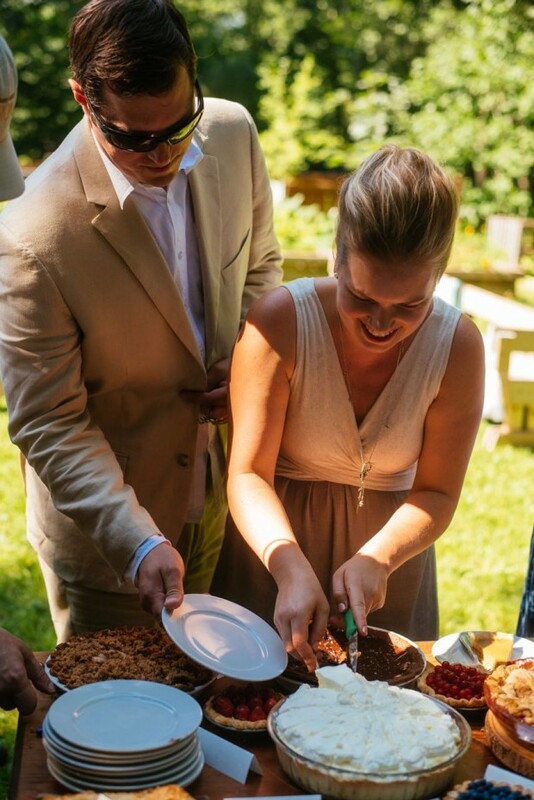 The first ones to be served, Miranda and Mike had a strategy for the pie table: they each took three different pies and they shared the plates. So smart. I know this marriage is going to be a lasting one. 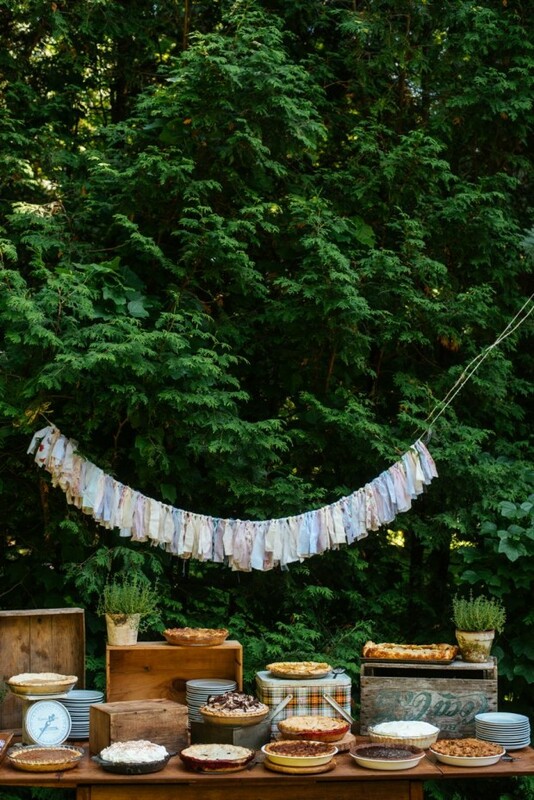 How to set up a functional outdoor bar. How to set up an outdoor buffet in a canoe. This is such a lovely layout and I love all the different pies! I’m so doing this at some point! What a beautiful table! Love the assortment of pies displayed on the different wood boxes. It makes me want to get into the kitchen and make a pie! Hey girl Love the pics!! And helpful hints to! This looks lovely. I came across your blog from the costco magazine:) Curious about if you ever run into major allergy issues at this sort of thing? 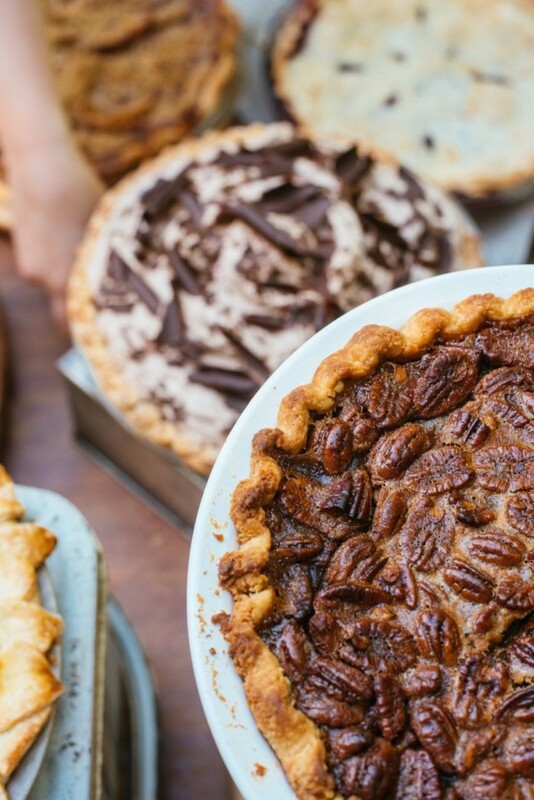 I know that I am deathly allergic to pecans so would not be able to touch any pies around the pecan and would worry about cross contamination when cutting the pies. Many of my family are also deathly allergic to nuts and also ( weirdly) bananas…Do you ever run into those issues at any of your parties and how would you go about dealing with that? Welcome! Thanks for stopping by. It’s a good question, but one I don’t have much experience with. I do ask around and see if my guests have any serious allergies, but then we just proceed as usual. Perhaps they abstain and I just don’t know it. I love this! 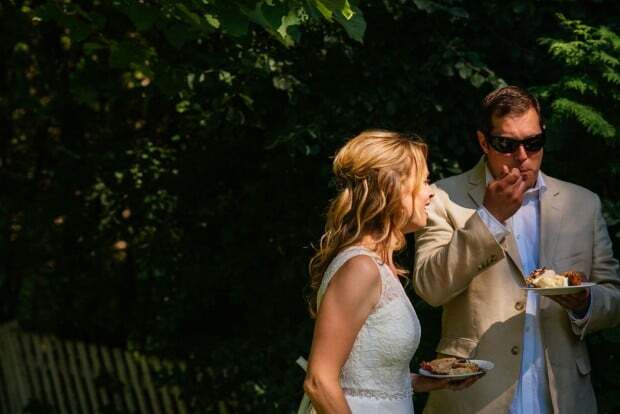 We had a pie buffet at our wedding reception as well and the guests loved it, some still mention talk about it. The only downside was all the pies disappeared so fast, my husband and I nearly missed out while we were getting some photos taken! Yes, the pie doesn’t last long! I love, love, love this! We are a family that loves a good pie. Anytime my father-in-law does a project around our house, I always repay him with pie. It’s a good trade-off. Also, your mocha espresso pie is one of our favorites now. I’ve made it multiple times and it is SO good!